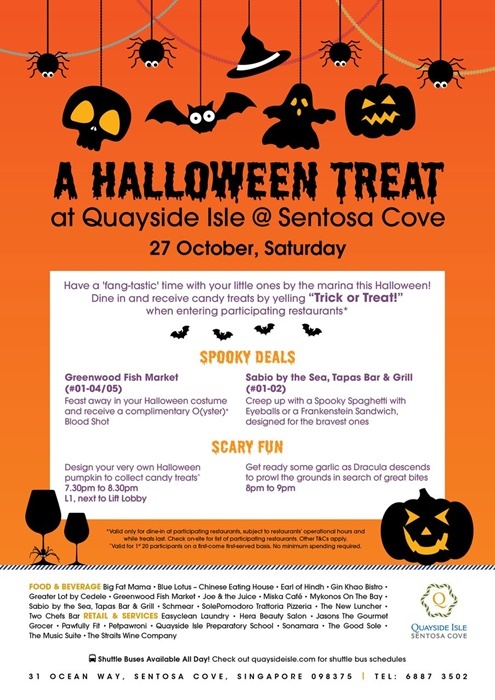 Come and celebrate Halloween at Quayside Isle @ Sentosa Cove! 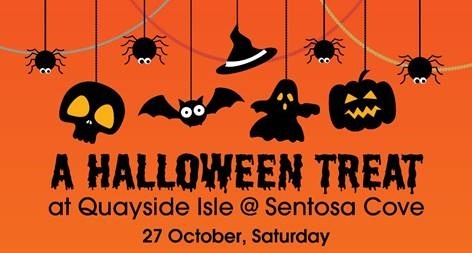 Halloween at Quayside Isle @ Sentosa Cove presents A Halloween Treat on 27 October 2018 for a fun-filled spooktacular Saturday evening with family and friends! Decorate your very own pumpkin, shout out “Trick or Treat” for yummy candies and have a close encounter with Quayside Isle’s very own Dracula! Have a BOO-tiful Halloween with delish food and fun activities at Quayside Isle! Be part of the spooky adventure by heading down to Quayside Isle, ONE°15 Marina and Sentosa Cove Village. Visit the pit stops at various locations and collect 3 stamps on the Halloween Thrills card for a chance to win prizes at the lucky draw**! The Halloween Thrills card can be collected at Sentosa Cove Village (opposite playground), while stocks last. Halloween is not complete without some good ol’ Trick or Treat! Come dressed in your Halloween best and get rewarded with sweet treats that would go perfectly with your dine-in meal at participating dining outlets when you shout out “Trick or Treat”! Show off your crafty side by decorating your very own pumpkin bucket to collect treats. Fastest fingers first as only the first 20 participants will have a go at this Halloween must-do! No minimum spending required. Only the bravest will survive as Quayside Isle’s very own Dracula roams around the marina. Prove yourself worthy and face your fears by requesting (nicely!) for a picture to earn some ghostbusting points! Come dressed in your spookiest outfit and receive a complimentary O(yster)+ ‘Blood Shot’ to satisfy your cravings, available from 27 – 28 October 2018. Have a go at these frightening Halloween-inspired dishes and tasty drinks, available from 27 – 28 October 2018!